It all started back in 1945 when Mr R.M. Bob Scott had a business named, The United Printing and Cardboard Manufacturer Ltd. located on Adelaide Road, Wellington. In 1948, Bob met Mr Jim Doig and together they formed The United Box Company, but they had to move because the business was too big for the community. They decided to look outside the area for cheaper rental places. So Mr R.M Bob Scott and Mr Jim Doig decided to go to Levin because the rentals were cheap. However, the community didn’t want them, so they moved down to Shannon and bought the old Druid’s Hall on Nathan Terrace. 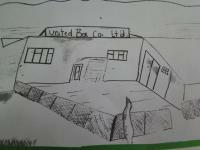 In other word’s what we're trying to say here is that by 1948, the little business had grown and formed, adopting the name The United Box Company Limited. In 1958 a new era began when The United Box Company Limited merged with The United Empire Box Company Limited (U.E.B.) but was known by the locals as The Box Factory. The U.E.B. would produce products such as cardboard boxes, tobacco packets, egg cartons, and corrugated paper which was used to make biscuit packages. The factory also made the first kiwi fruit layers (and get this, they made twelve million of them). Then the factory got shifted to Te Puke. Mr John Stern used to be a worker and employee at the U.E.B. and was next in line to be the manager. He still sees his fellow employees in and around Shannon. The machinery in the old Box Factory was big and dangerous. You had to be really careful. Even though Mr John Stern was always very careful he lost his small pinky finger and almost his entire hand. Thanks to Mrs Pope who turned the machine off just in time to save his hand. Mr John Stern is still happy and grateful that he has a working hand. This has changed his grip on the golf club because he was part of the NZ Golf Team. 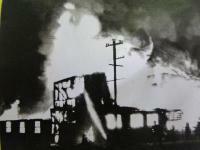 A disaster struck on September 18th 1957 when a fire destroyed a heap of the factory. With the Shannon community’s help (by donating money) The Box Factory was able to bring back what they could. After one week of the disaster some of eighty-two employees were sent to the Hastings plant to resume production. There were sketches and plans to rebuild and reconstruct the buildings. 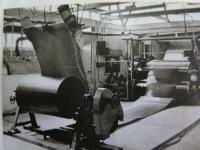 There was a factory built in Porirua which soon became Ashley Wallpaper Ltd. The U.E.B Factory is around sixty-three years old. Mr John Stern worked from the year 1952-1989, and Mr John Stern’s fellow employees made him a great sign that was as bright as the sun that said Farewell Johnny (Sterny) and wishing him the best. Mr John Stern told us that he got on pretty well with his fellow employees. U.E.B. helped the community by generously sponsoring heaps of organisations around our Shannon Community. Now we think that’s a great way to start a positive and healthy relationship throughout our community so we can all get along and look after one another. Interview with Mr John Stern. From Bush and Swamp By Mrs Marjorie Law. Team effort by Maddison (Year 8) and Te Puawai (Year 8).